Difficulty: Pink - we walk uphill from the start of the day to get high above the river then descend through the forest to lunch and repeat the pattern in the afternoon, climbing above the Wye on the opposite side before descending back into Chepstow at the end. The surface is trail for the vast majority. Starting outside Chepstow Castle, you’ll instantly get the impression of being transported back in time. 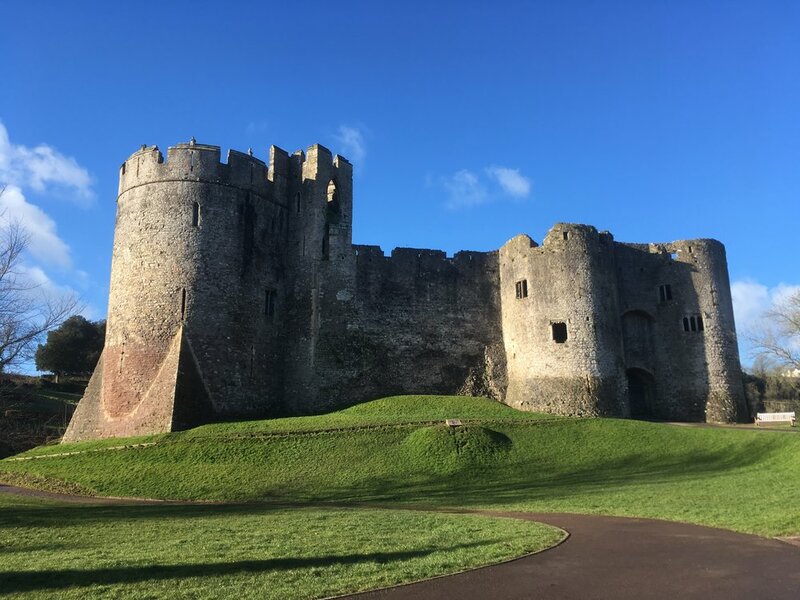 As you head out and cross the ornate bridge over the river, you’ll be able to see just how impressive a fortress it was, built right up to the very edge of the sheer cliffs of the Wye Valley. Built in 1067, it’s 800-year old doors are the oldest castle frontage in Europe, although they’re now in a protected display within the castle to preserve them for future generations. Climb up out of the town on the Offa’s Dyke path, following the route of the 177-mile long fortification built by King Offa of Mercia in the 8th century to act as a border with what is now Wales. At the top of the climb you’ll get to see part of the impressive remains of this 20-metre wide, 8-metre high earthwork rampart. Head through peaceful forests high above the river until you get a jaw-dropping view of the ruins of Tintern Abbey and its village namesake below, then descend and cross the river on the old railway bridge where lunch will be waiting. The return leg takes you high above the river valley once again, this time on the opposite side, following the Wye Valley Walk through thick forest, a site of special interest with many rare plants and animals, including the Peregrine Falcon. Pass through the the Piercefield Estate, an impressive country park once linked to the now ruined manor house. Sights include caves carved into the rock, the Eagle’s Nest and 365 steps, a viewpoint offering an incredible panorama high above the river to Chepstow, the Severn and its famous bridges, and England beyond. Finish by descending once more into Chepstow until a small park leads you back past the castle. Through this walk you are able to support any or all of our great charities; Bristol Animal Rescue Centre, Devon in Sight or One25. We will donate £1 from your entry fee for each day you enter to be shared equally between the charities and we’ll send you details about how you can use the challenge to fundraise for one or all of them too if you’d like.